The Chinese government recently announced a near 10% increase in their military budget for 2018. Chinese state media have defended the decision, saying it is part of a modernization program, calling the increase "proportionate and low." "A large part of the growth of the defense budget is to make up for the low military spending in the past and is mainly used to upgrade equipment and improve the welfare of servicemen and women and the living and training conditions of grassroots troops." "As China becomes more and more integrated in the global economy it understands that maintaining economic superiority requires more security. In Africa, where China has poured vast sums of money into various projects, they have also been quietly building small military bases and developing relationships with various African military and security forces. For example, in Djibouti, once the exclusive military domain of the US, China now operates a naval base adjacent to the Port of Doraleh, which is west of Djibouti City." "China is also cognizant of the waning influence of the United States. 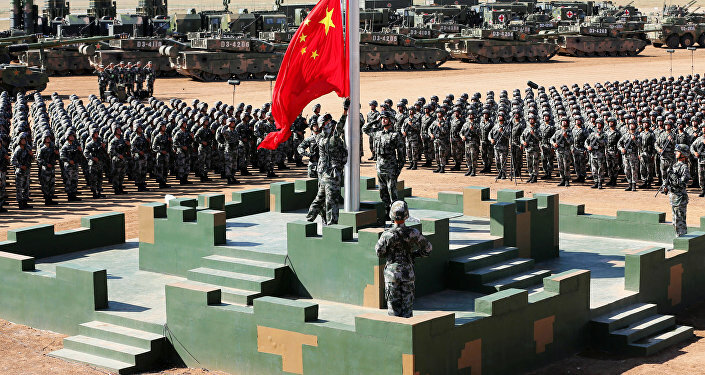 China views their inability to contain groups such as al-Qaeda and ISIS [Daesh* in Arabic] as a major problem, and as such have increased military spending for fear of these groups targeting Chinese interests at home and abroad." "While President Trump congratulates himself for defeating ISIS in Syria and Iraq, the group has found new life in Northern Afghanistan. Over the past two years, ISIS has mounted deadly attacks throughout the region." "This has long worried China, which shares a small border with Afghanistan's Badakshan Province. China fears that fighters may use the Wakhan Corridor to enter into Xinjiang. As more Uighur and Central Asian ISIS recruits flee from Syria, China is increasingly fearful that they will use Wakhan as a means of attacking China directly." North Korea: A Problem for both China and the US? "North Korea may even pose a bigger threat for China and explain their increased military build up. The increasingly insane rhetoric from the US over the threat of a nuclear North Korea has once again dragged China into the possibility of serious military conflict." "If Kim Jong Un's government were to be toppled, China would never accept Korea becoming unified and made into an even larger US military colony right on its border. Thus the threat of fighting US ground troops for the first time in decades becomes even more of a possibility. China would most likely look to prop up the North Korean government and become heavily involved in what happens afterwards." They passed us in 2014 & are already ~20% ahead of us. Military budget = $460 billion. We are no longer the sole superpower. 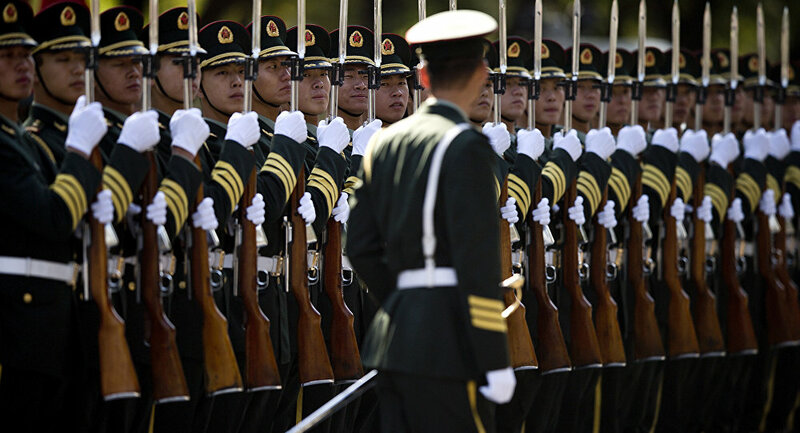 The US response to China's increased military budget may be crucial. The commander of the US Navy's Pacific Fleet expressed concern about the lack of clarity and transparency regarding where the money will be spent, and why. Admiral Scott Swift said that China's "intent is not clearly understood," adding, "These investments and commitment need to be taken with full transparency." "We have already seen Trump's desire for economic warfare with China become more of a reality. We could see high tariffs being placed on Chinese goods and there is the possibility of economic sanctions being placed on particular Chinese officials." "The US may also continue its practice of sabotaging Chinese negotiations in Afghanistan. China has used its special relationship with Pakistan to attempt to bring the Taliban to the negotiating table only to see the US and Afghan intelligence hinder these attempts. The CIA, who have long-standing ties with jihadi factions like ETIM, could also make trouble for China. Larger scale attacks and bombings within China could very well happen." "Of course the US will use this as yet another excuse to increase their massively bloated budget. Congress has been all too eager to please the Military and Intelligence establishment by going above and beyond what even they ask for in terms of money. The possibility of an arms race with China is by no means out of the question." The views and opinions expressed by Pearse Redmond are those of the speaker and do not necessarily reflect those of Sputnik.